This is a sermon for the feast of All Saints. The Scripture it references is Matthew 5:1-12. I must admit, I have a terrible mental image to go with our gospel reading today. In my head, I can see Jesus – a sort of 1970s, anachronistically hippie version drawn from movies that were on TV when I was very little – addressing the crowd in a way that suggests he’s slightly spaced out and that what they see is a guru of transcendental spirituality. Only become poor in spirit, meek, and merciful – this mental image seems to suggest – and you too can know karmic bliss. I’m sure you know the kind of version of Jesus that I’m talking about. The trouble is that that image has very little to do with what Jesus was on about when he said these words. So despite their familiarity, we might have to work hard to get past our own assumptions, to let them speak to us on their own terms. Theirs is the kingdom of heaven. But what does that mean? It doesn’t mean they get to go to heaven when they die. (I mean, they might, but that’s not the point being made here). It doesn’t mean they experience heaven as a kind of internal spiritual state. (This is not about personal subjective and emotional experience). And it doesn’t mean that they’re morally superior, or holier, than those around them. (Again, they might be, but that’s not the point). What it means is that they have a radical understanding of the reign of God, and their own relationship to God as ruler over everything that exists. They are conscious citizens of heaven, who acknowledge no authority, no power, no claim on them, more important or more enduring than that of God. This vision of the reign of God rests on three key truths. First, the truth that God is creator. When you know that God has the imagination, the creativity and the wisdom to envision all that exists, and the power, the awesome force and intensity of desire to cause matter and energy to exist and interact by sheer will; and when you know that everything that exists, only continues to exist moment-by-moment, only continues to operate according to laws of nature, because God wills it; when you know that your life is sustained from one breath to another only because God allows it; when you really get that, then anything which might try to make a competing claim on you is seen for the pale imitation that it is. Second, the truth that God is active in the world today. Even though Jesus said this before the resurrection, when most people didn’t know who he was, his disciples were beginning to grasp this. In a world of evil, of darkness, oppression, suffering, and so on, God is not absent, uninvolved or uncaring, but at work. This is the point of the miracles and exorcisms of Jesus’ ministry; this is the point of the incarnation, with God coming to live as one of us. When you know that God hasn’t abandoned us but is at work in your life and in the world around you, then you know that you can participate in what God is up to, and experience God’s rule directly in your own life. Third, the truth that this current reality will end. There will be a last day; there will be a judgement, there will be an end to evil and a renewal of all that is good. There will be a time when the reign of God will not be obscured or marred by anything which would seek to contradict it. When you really know that, you can walk forward into the future with confidence and hope and joy, knowing that what is coming is going to be so much better than what has been before. These three truths – that God is creator, that God is active in creation now, and that there will be a time of new and perfect beginning – are the keys which let us understand God’s total and absolute reign, and give ourselves to it. That’s why the poor in spirit are blessed; they know that despite their own limitations, they belong utterly to, and are able to participate in the work of, a God who holds together everything that is and will be. That’s why those who are persecuted for righteousness’ sake are blessed; in their righteousness they know and experience more of God than those who are persecuting them ever will. And this is the kingdom of heaven which has gripped all the saints through the ages. The martyrs died for it, the missionaries and pastors laboured for it, the apostles and bishops and theologians helped us put words to it, the prophets proclaimed it and the monastics prayed for it; but all of them knew, deep in their very being, that these key truths of the reign of God define our existence more deeply than anything else. It’s no coincidence that it’s just a bit further along in this sermon that Jesus teaches his disciples to pray, “your kingdom come.” Not because God isn’t ruling now, but because as we understand the reign of God, we place ourselves within it, and our whole being becomes aligned with the will of God. We become people who labour to see the world be what God would have it be; who find the words to tell those who don’t yet know, who don’t yet understand, how all of creation is held in the hands of a loving God. The kingdom of heaven belongs to those who do God’s will. Or perhaps, it’s more accurate to say that those who do God’s will, belong to the kingdom of heaven. It’s really that simple. We are called to do God’s will because we are part of creation; called into being for relationship with God. We are called to do God’s will because in this world’s suffering, darkness and despair, God is at work, bringing healing, light and hope. We are called to do God’s will because we know that God holds in trust a perfect future, and invites us to be part of that future by our own choice and commitment. That’s what it means to belong to the kingdom of heaven. That’s what it means to be a saint, in the truest sense of the word. As we celebrate today all the rich variety of saints who have gone before us, let’s not miss the choice that always stands in front of us: to do God’s will. To claim the kingdom of heaven for our own. To place ourselves amongst that great cloud of witnesses to it. This is a sermon for the twentieth Sunday after Pentecost. The Scripture it references is Matthew 22:15-33. We had a couple renewing their vows on their golden wedding anniversary this morning, so the sermon is written with that in mind. What do you reckon? Are you looking forward to your wings and halo? And would that somehow compensate for being single? At first blush, this reading might look as if it has quite a low view of marriage; as if it’s fine for something for us to do, you know, to pass the time in this life; but that when this life is over and we go to glory, it won’t really matter any more. But I don’t think that’s what Jesus is saying, exactly, although that might take some unpacking. The first thing to note is that this discussion really isn’t about marriage at all. The issue here is about what happens after we die, and whether resurrection is really a possibility. The Sadducees argue that it is not; and they make that argument because, if we see resurrection simply as picking up where we left off, a kind of continuation of this life, there are significant logical problems with that. So, seeing the logical absurdity of having to choose between several spouses, or other problems of a resurrected life that is just “more of the same,” they reject the possibility. I guess what Paul talks about as a “spiritual body” is his way of describing what Jesus means when he says we’ll be like the angels in heaven. But what does that mean? To be honest, I don’t know the details; and I suspect it’s something we can’t really understand from this part of our existence. But it follows that if our bodies undergo radical change, that so will our human relationships. The cycle of life, with the particular demands of growing and aging, of pair-bonding and parenting, and all of that, will clearly not function in the same way. I don’t think that means we will lose the potential for meaningful relationships, but trying to describe them in terms of what we know now clearly isn’t going to work. But – and this is the thing I really want to focus on today – that doesn’t rob our family relationships, or specifically our marriages, of eternal significance. Human relationships are the context in which we learn, change and grow; and marriages, as the most intimate and enduring (at least ideally) of those relationships give us a particularly intensified opportunity for that change and growth. They can be a crucible for holiness. Marriage is an all-embracing experience. We bring to it all that we are, in giving ourselves to each other, and in turn it is the foundation on which all of our later life experiences are built. And being married is not, and never has been, a fixed state of happy-ever-after (after 50 years how well I’m sure you know that!). There are troubled times, times when you’re divided, or there are power struggles, or it seems like you don’t know the way forward. It’s in facing up to those struggles and learning from them that our own personal growth comes (as well as increasing depth and intimacy in the marriage). This growth comes about because in all the ups and downs of a marriage, we find ourselves at our best and worst, our most loving and joyful and generous, and our most fearful, vicious and selfish. If we’re paying attention, the way we treat our spouse and our family holds up a mirror to our weaknesses and sins, and shows us where we still need grace. Love is patient, apparently, and it seems marriage is designed to gradually teach me that! Ultimately, I’d describe that “energy to embrace newness” as hope. If faith is “the assurance of things hoped for,” as the writer of the Hebrews put it, then having the energy to imagine that things might be different, to welcome and even collaborate in that newness, and to be assured that God is at work in that, bringing about what is good and true and just… is one possible end result of being attentive to what marriage can work in us. Of course all of this takes work. It takes commitment. It takes time and making the relationship between the two of you actually a priority. This is easier in some phases of life than others; and maybe easier after the children have moved out, than when they are little. The golden years, rather than being about fading or declining (which some people might fear) can be a time of deepening and enrichment, if you’re clear that that’s what you want them to be. Or, to put that the way Pope Paul VI put it, married love is an impulse towards the Infinite. Now, I do want to add a disclaimer. Not everyone is able to marry, not even all those who wish to; and in talking about the potential of marriage in this way, I don’t want to suggest that this crucible of holiness that we find in relationships, isn’t available to single people in different ways. Intentional and intimate relationships of all kinds can afford us the same opportunities. But marriage is, for most of us, our most committed, most enduring and most intimate relationship, so it’s worth stopping to reflect on it specifically on an occasion like this. So if I’d dare to offer you any suggestions, on this special day, it would be to be open to the potential of your marriage; to help each of you continue to grow; to support each of you to be your best selves in the world; and to be a relationship which cultivates hope and openness to what God might be up to. And may God continue to bless you richly. This is a sermon for the feast of Michael and All Angels. The Scripture it references is Revelation 12:7-12. This picture* looks a bit like something out of Tolkien, doesn’t it? 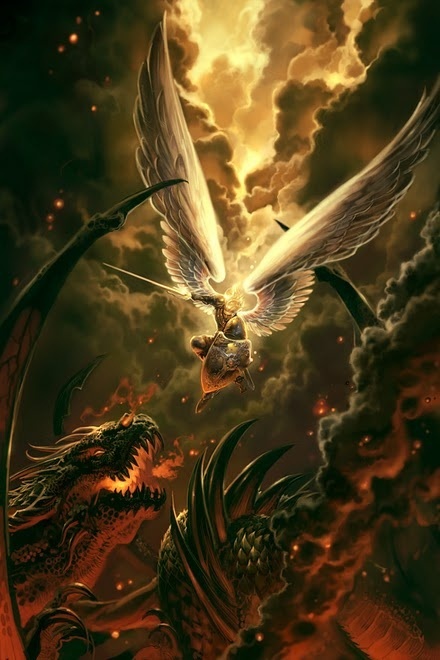 If, like me, you grew up reading The Hobbit long before you ever read the book of Revelation, you could be mistaken for thinking that this sort of imagery belongs to the world of fantasy, not of faith. Dragons, cosmic war, mythic signs… what are we to make of all of that? I know that Revelation is, for most people, a confusing jumble; a series of visions without a good plot line, mixed in with a vague idea that this is supposed to have something to do with the end of the world. And – if we’re honest – it often doesn’t make a lot of sense, and we tend not to read it very much by choice. But on a day when we stop to think about the reality of angels, and what role they might play in the life of faith, to read from Revelation is actually very fitting. The idea behind this genre of writing is that the physical world around us – what we can see, hear, touch and so on – is not the whole truth about reality. A parish like this one has something of a head start, perhaps, in being able to come to grips with this; and that’s because apocalyptic writing, in its use of symbols and images to convey deeper truth, is a lot like the language of liturgy. Just as, behind the symbol of shared bread, is the deeper truth of our belonging to one another in the church, just as behind the symbol of lit candles is the truth of the light that Christ brings into our lives, and so on – I could go on for ages – behind all of life, says apocalyptic writing, is deeper truth and deeper meaning. And if we are unveiling layers of meaning, that implies that things are not entirely as they might seem. So let’s take a few minutes to look at what John says is really going on behind the veil of everyday life. So this morning’s reading begins with “And war broke out in heaven…” This war is timeless. It began before the creation of the cosmos, and it continues to be one of the deepest truths of our reality, which shapes everything we experience. Let me pause here and say that I know some of you won’t believe in a literal devil and demons. That some people see those as powerful imaginative ways to represent our experiences of evil and darkness. But certainly the New Testament authors did believe in those powers as being wielded by actual evil personalities; and whether we see them as personal or impersonal, we all know that human life is marred with that reality of genuine evil. Anyway. So there’s a war; and we’re all caught up in it. The forces of good vs. the forces of evil; and what we’re given a glimpse of here is that evil is losing. In fact, evil has lost, and all that remains is something of a cosmic mopping-up operation. This text, strange as it is, is telling us to hope. Yes, we experience bad things; evil wreaks havoc; there is oppression and abuse; human beings are hypocrites; and so on. But what John’s vision showed him is that that’s just the mess that needs cleaning up after the battle’s been won. It’s not the last word. It’s not forever. It’s purely temporary, and the powers of God – here represented by the angels – will throw down what evil remains and creation will be renewed. Our reading today finishes with “the time is short.” The time is short! This soon shall pass! We might be suffering right now, but we’re on the winning side. You might have heard some more Pentecostal types of Christians talk about spiritual warfare; and while that can sound quite intimidating, really all that means is recognising the reality of this cosmic war, and deliberately aligning ourselves with the winning side. In that sense we engage in spiritual warfare every time we meet for worship. Every time we pray “your kingdom come.” Every time we choose hope over despair. We are saying that we recognise the deeper reality of good and evil, and we choose good. But there’s something else we’re called to do in this mopping-up operation, and it’s hinted at in this reading too. John heard a loud voice in heaven, proclaiming… but he didn’t tell us whose voice it was. Remember that for John, heaven and earth are two interwoven dimensions of the same reality. What he sees in his vision tells us the deep truths of our lived reality. So when he says there’s a loud voice in heaven, proclaiming, he’s also saying something about the very real fabric of our lives. Proclaiming is our job. We’re given this vision, this insight; this peek behind the veil; not just so that we can know what’s going on, but so that we can share that knowledge with others. We’re given a message of hope, and we’re supposed to make that hope known to everyone who hasn’t heard it yet. It’s not just one voice in heaven; or more accurately, it’s one voice made up of the many voices who have seen the victory and who cry out to tell all creation that the forces of evil have been thrown down. That the power of God has won. That it’s time to rejoice! It’s grand final weekend. The secular world has just shown us something of the rejoicing of those who win. And we’re called to lead the way in that rejoicing, on a cosmic scale! Michael the archangel might have led the fight; we get to kick off the party. And this is the thing, really; an angel is, more than anything else, a messenger. This day where we remember angels, reminds us that actually, we’re all supposed to be messengers. We’re all supposed to carry with us wherever we go, a message of hope and joy and faith. Ours is the loud voice resounding through heaven and earth. Is your megaphone at the ready? Is that an intimidating question? If you’re unsure about being that loud voice, remember that you don’t do it alone. We need to find ways, together, to be messengers of hope and joy and faith. We need to find ways to make sure that our voice resounds, beyond our doors, down the street, and to all the surrounding area. That we announce whatever brings hope; whatever lets people know that they can trust that in the end, God wins; whatever lets people in on the infectious joy of knowing that the time of suffering is short; that’s our job. So let’s build a megaphone.